Golden retrievers make fantastic family pets owing to their loyal and loving ways. As such, any golden retriever owner will want to buy the best food for golden retriever pets that is available on the market. Here, we list our top 10 picks as the best dog food for golden retrievers, many of which can be used as the best food for golden retriever puppy dogs that have just entered a home. There are some well known brands on this list like Taste of the Wild Dog Food or Royal Canin golden retriever suitable food, as well as lesser known makes. We also investigate what makes the best retriever dog food in terms of composition of ingredients and what vitamins and minerals need to be included for the healthiest dog possible. Importantly, we also discover what ingredients to avoid completely when shopping around for golden retriever food. This Taste of the Wild dog food is what we have rated as the best dog food for golden retrievers. We love it because of the high content of salmon that is included so that it is rich in lean protein to provide your golden retriever with the best nutrition possible. All other ingredients are also premium grade and contain a high amount of vitamins and minerals with the addition of fruits and vegetables to act as antioxidants. The high content of salmon also results in a large amount of Omega fatty acids which are necessary to keep a dog’s coat and skin healthy. 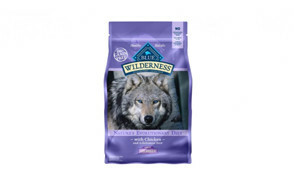 Blue Buffalo Wilderness have produced one of the best food for golden retriever dogs possible with this composition of ingredients in its kibble. It was only just pipped to the post by the Taste of the Wild dog food above. It is grain free and very high in protein to meet a golden retriever’s needs. The main protein in it is deboned chicken but there is also a high amount of chicken meal and fish meal within the biscuit pieces too. The food will ultimately help promote healthy muscle development as well as continued joint health with the inclusion of glucosamine. Omega fatty acids help to promote a shiny coat and healthy skin. A balanced diet is necessary in retriever dog food is arguably more important than any other dog breed. 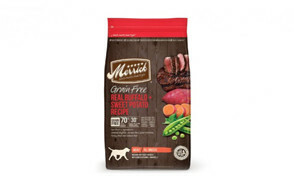 This product from Merrick’s is fantastic at providing everything a retriever needs to be strong and healthy. This is down to the incredibly high amount of protein included and only a moderate amount of fat by using only the finest ingredients that make this food delicious for your pet too. It has a suitable amount of calories as required within the best food for golden retriever dogs or even as large breed puppy food. Even as a human, sweet potatoes and salmon are a fantastic basis for a meal. Their high content value within this retriever dog food makes this kibble a brilliant way to ensure that your dog is getting everything he or she needs through a well balanced diet. Some use this food for dogs that suffer from food allergies as there are really only five types of ingredient in this kibble – sweet potatoes, salmon, potato protein, fish meal and canola oil. It is also comes loaded with vitamins and minerals to help their coat and skin look great at all times. This is perfect for those that need large breed puppy food – golden retriever or not. That being said, it is perhaps one of the best examples of the best food for golden retriever puppy dogs available on the market owing to the use of high quality protein in the form of chicken and eggs as well as the inclusion of whole grains, vegetables and fruit. Fromm Family pet foods are synonymous with only using the best ingredients possible for their dog food. The result is that this kibble has a high content of protein in addition to some prebiotics and probiotics so that this example of the best dog food for golden retrievers is excellent at boosting a dog’s immune system. It will also help build stronger joints and keep their skin healthy. Specially formulated as large breed puppy food, this is a prime example of the best food for golden retriever puppy dogs that money can buy. Owing to its stellar composition of antioxidants, probiotics and superfoods, golden retrievers who eat this food will have a big aid in their digestive support as well as the ultimate balance of necessary vitamins and minerals. Wellness Core have managed to cram in a great deal of goodness into this dry kibble that is suitable as either retriever dog food or labrador dog food. It has a high level of protein that is necessary to keep retrievers and labradors functioning as well as nutrients that come from ingredients like flaxseed, blueberries and probiotics. Overall, your dog will have a healthy body owing to their food that is fortified with vitamins and the inclusion of Omega fatty acids for a shiny coat. Royal Canin golden retriever breed dry dog food is the last on our list as foods suitable for keeping any golden retriever dogs in prime health. We rate it as it promotes the best cardiac function with the inclusion of ingredients like taurine, EPA and DHA. Additionally, these also help with having a healthy coat and healthy skin all the while being calorie controlled so your dog will not put on weight if you follow the feeding instructions. There are a number of things to look out for and consider when you are buying the best food for golden retriever breeds of dog. In doing so, a dog owner will be able to ensure that their golden retriever remains in the best and optimum health for as long as possible. This is because diet is one of the key ways that we can help keep our pets healthy as it provides them with the energy needed to walk and exercise as well as maintain their fur, coat and skin. For starters, ensure that your chosen brand of retriever dog food meets the nutritional needs of your dog. There is more information on this below, but ensuring that your dog’s nutritional needs are met is an essential way for your dog to stay healthy. In this way, owners need to ensure that if they still have a young dog, that they have also chosen the best food for golden retriever puppy dogs as puppies have different needs to adults or seniors. The nutritional needs of any age dog will have a bearing on how much protein, carbohydrate and fat is included in a dog’s kibble. Secondly, there are a number of ingredients that should not be present in any of the best food for golden retriever dogs - puppies or not. Sadly, there are a number of dog food manufacturers that simply make retriever dog food, or otherwise, to make money. This means they don’t always have the best intentions at heart so that dogs can be given food that has ingredients that aren’t safe. They are listed below in our ingredients to avoid section. Lastly, owners should know the common health problems of golden retrievers and how golden retriever food can help prevent these conditions from ever developing. Golden retrievers have the following specific nutritional needs for their breed. To be the best dog food for your retriever you need to look for a food stuff that has moderate to high protein that hopefully comes from an animal source. The amino acids that your pet needs are far more efficient at doing their job if they come from animal protein. Ideally, a retriever dog food will have at least 25% of its content coming from protein. Retrievers are prone to gaining weight easily but that does not meant that they should have a fat free diet. Realistically, it does need to be low in fat so try to find a food that does not have 20% or more fat within its content. Look for food that contains these specific nutrients in your retriever dog food or even your labrador dog food. Calcium, phosphorus, B Vitamins, Vitamin A and Vitamin E. Calcium and phosphorus are particularly important to puppies. EPA, DHA and ALA are nutraceuticals that your golden retriever needs so that they can be in the best condition with respect to their cardiovascular abilities as well as having a good functioning immune system. TBHQ - This is a form of a preservative that can hurt a retriever’s health by causing damage to their DNA. It has been seen to encourage the development of cancer cells within a dog’s body. BHA and BHT - These nasties are widely thought to be carcinogenic but can still find their way into dog food by disreputable brands. Propyl gallate - While the jury is still out on whether the negative press that this compound has garnered in terms of human health and the links it now has with breast cancer, it is always best to be on the safe side in terms of your dog’s health too. It’s probably best to avoid to ensure that your dog is not in danger of developing the condition like humans can. Ethoxyquin - This ingredient is actually banned in the EU and Australia already. It has been seen to cause blood problems as well as liver issues. This is particularly bad for golden retrievers given their predisposition for Aortic Stenosis and von Willebrand’s disease. Sadly, one of the most loved dog breeds in the world is susceptible to a number of health problems that are common to the breed. This can come from their simple physiology but also from the fact that as they are so loved as a purebred, very little outside DNA has infiltrated their bloodline to strengthen their health. Golden retrievers are far more susceptible to two particular types of cancers than others. They are hemangiosarcomas and lymphomas. Lymphoma will attack lymphocytes in a dog’s immune system while hemangiosarcomas only seems to affect dogs as a species by attacking their blood vessels. Giving your canine the best dog food for golden retrievers can help as it stops cells metastasizing into neoplastic cells. This complicated sounding condition is when the valve at the exit to the heart narrows. It means that blood flow becomes more limited around a retriever’s body. It has been seen that a labrador dog food or a retriever dog food that is high in Omega fatty acids can help lower blood lipids to prevent this condition from worsening. A retriever is a large breed of a dog. As such, they are far more prone to dysplasia in both their hips and their elbows than smaller breeds. To help prevent against this the best dog food for golden retrievers is rich in calcium, glucosamine, phosphorus and chondroitin. This is because these substances work to strengthen the bone. This condition is hereditary and means that your dog’s blood will sadly lack the ability to clot which has obvious disorders. Vets recommend a retriever dog food and diet that is rich in Vitamin K if that is the case. Due to having a deep chest, golden retrievers are likely to suffer from bloating which sadly can lead to gastric torsion. This can very often be fatal and can only be sorted through an invasive surgery. To prevent bloating, your dog specialist retriever dog food in smaller amounts more frequently throughout the day. Q: How often should I feed my golden retriever? A: More often than not, it is more than fine to feed your dog twice a day and split their allocated amount of daily food in between these two sittings. However, given the golden retriever’s predisposition for stomach turning and gastric torsion, it can be beneficial to split their kibble into even more sittings throughout the day if you can. This is not always possible, though it is particularly beneficial the older your retriever becomes. Look into ways to slow down your dog’s eating if you cannot be there to feed your dog three to five times a day. Q: How much should I feed my golden retriever? A: The amount that you feed your golden retriever is really down to the amount of calories that your specific canine requires. In the main, dog owners can come to this amount by looking at the average weight that a female retriever or a male retriever is. This weight needs to be in kilograms. From there, vets have come up with a calculation that allows owners to calculate calorie need specifically. All owners need to do is multiply their dog’s kilogram weight by 0.75 which is the Resting Energy Requirement power constant. This number then needs to be multiplied by 70 from there, owners need to multiply this number by a suitable Maintenance ENergy Requirement figure. This figure depends on whether your dog is neutered or unneutered and the amount of work or activity your dog does on a daily basis. As a general rule, dogs that are of a healthy weight and are unneutered have a Maintenance Energy Requirement factor of 1.8. Q: What is the best dog food for golden retriever with allergies? A: Ideally, you should work with your vet to overcome your dog’s allergies through their specific diet. Some manufacturers will make specialty golden retriever food that also addresses intolerances or allergies that can be addressed through food though some foods will be suitable but won’t be advertised as such. This is why consulting your vet is the best way forward as they not only know the market well, they will also know your dog almost as well as you. 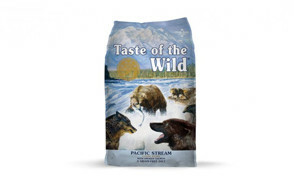 This Taste of the Wild dog food is the perfect kibble for those that want the best dog food for golden retrievers or even the best food for golden retriever puppy dogs. It has the ultimate blend of quality protein, fats and fiber within its composition as well as all the necessary vitamins and minerals needed to help keep a golden retriever happy and healthy. For those that are concerned about their golden retriever, or even their labrador, they need not look any further than Taste of The Wild dog food.